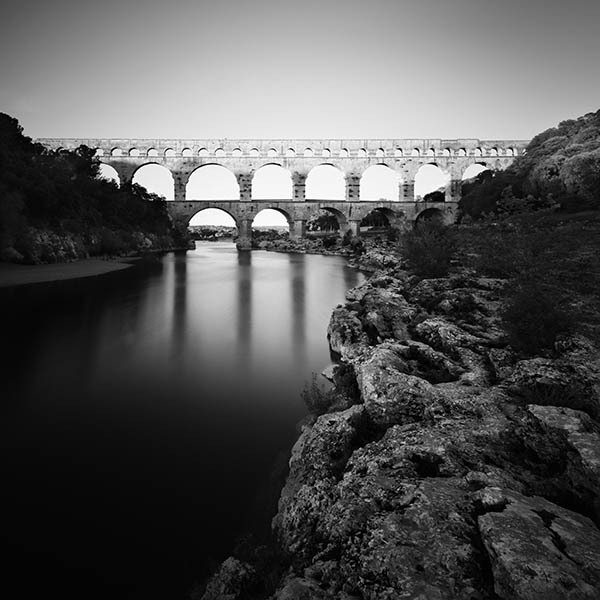 A photo taken at dusk of the amazing aqueduct called the Pont du Gard which was built by the Romans about 2,000 years ago to carry water across the River Gardon. It's part of a 50km long aqueduct that they built to transport water to the city of Nimes. I was astounded at the accuracy of construction that the Romans managed to achieve when building the Pont du Gard - the water flows by gravity in the aqueduct and the top of the 3 tiers of arches is built to a fall of just 1 in 3,000 which equates to a fall of just 1 inch over its length. The aqueduct used to supply 200,000 cubic metres a day of water to the city.